For a waiter or waitress, who usually wear just a half apron that wraps around their waists, it’s important that the frock contain several accessible pocket compartments in which to carry necessities for the job. Not only is this convenient for the time-pressed server, but it will also impress a dine-in customer when the item needed is right at the finger tips of their attendant. Items which should be carried by a waiter in their apron should include an ordering tablet, two or three pens, straws and matches. If feasible, extra condiments should also be allowed for as part of the supply load, like catsup bottles or packets and creamer and butter samplers. But be sure to protect liquid products from creating a mess within the apron this happens to even the best of servers! Sometimes, in the rush to fill a demanding customer’s coffee cup, leaning up against the counter or dining table causes a juicy explosion. It is best to keep those types of additives in a side pocket where they are safer. Color choices for restaurant cook aprons usually aren’t that significant. The full cover aprons of the dishwashers, fry cooks and salad makers are rarely seen by the dining public. That is probably a good thing; chances are those hard-working employees in the back are wearing everything from sauces to sautés! Choosing a shade for the waitresses, waiters, hostesses and bus boy’s aprons is a bit more unrestricted and allows for a creative presentation which compliments the décor of the restaurant dining room or color scheme of the table cloths and furniture. Lastly, when choosing aprons for restaurant employees, select material that can easily be washed and sanitized and does not require too much effort for stain removal. Although employees are hard working and dependable, they also have lives outside of the restaurant that may restrict time for uniform upkeep. 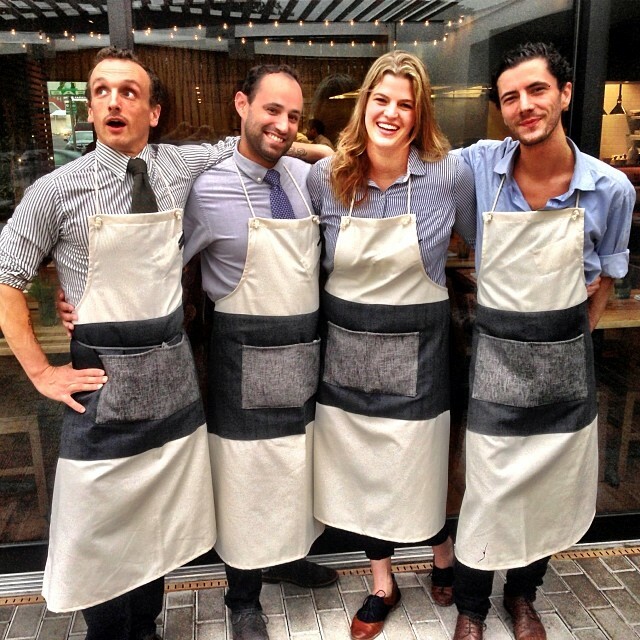 If possible, provide at least two aprons to each server or cook.